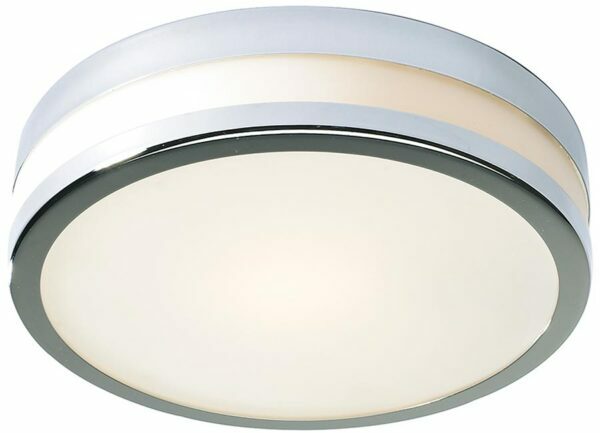 This Dar Cyro large flush bathroom ceiling light finished in polished chrome is modern, stylish and rated IP44. A simple 29cm diameter ceiling light suitable for bathroom use, with a polished chrome ceiling mount and outer bezel inset with an opal white glass shade. Takes a 60w lamp and compatible with LED bulbs (not supplied). If you are searching for a quality ceiling light to complement your bathroom, this is certainly one to consider. The smooth lines are suitable for a contemporary setting, whilst the traditional style makes it suitable for period bathrooms too. Rated IP44 and suitable for zones 1 and 2 and specifically designed for use in bathrooms but can be used anywhere inside your home except wet rooms. There is a smaller version of this flush bathroom ceiling light fitting available below. Or view our entire collection of ceiling mounted bathroom lighting on our main category page for a more extensive choice of ceiling lights suitable for bathroom use. Dar lighting is widely recognised as one of the leading suppliers of a full range of innovative, quality lighting products such as the Cyro large flush bathroom ceiling light finished in polished chrome featured here.